Our first and last stop on the Scarlet Wedding Tour was the Charleston Harbor Resort & Marina, arguably one of my absolute favorite venues in all of Charleston. With several impressive venues right on site for weddings and events, CHRM and their amazing event team are my first stop when venue hunting for clients or working on one of our many editorial shoots. Shannon Hartman, the director of sales at CHRM, was one of the first people I spoke with when we first started planning the Tour and she went above and beyond for us in the months that followed. We used the Yacht Club above the Fish House for the afterparty. 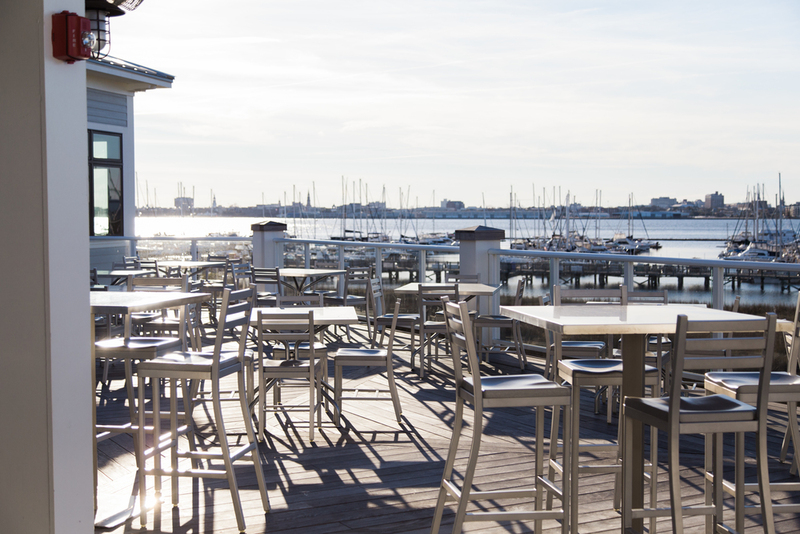 With enormous windows and panoramic views of the Charleston Harbor, the Ravenel Bridge and most of downtown Charleston, the Yacht Club is absolutely breathtaking. The last time we were at CHRM we put together an amazing nautical wedding inspired photo shoot (recently seen in Charleston Weddings Magazine) but wanted to stray from Nautical and show that although the space is perfect for that design theme, you're not limited to only that! Our design was inspired by Kate Spade, all things elegant, clean and fun. 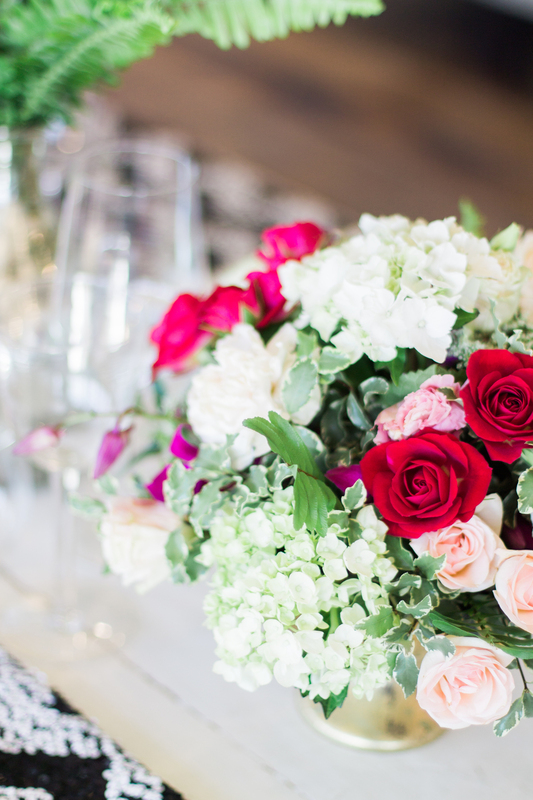 We started with black, white and gold as our base colors and added an array of blush pink, peach, fuchsia, lilac, dusty rose, and lots of greens to round out our stunning and fresh color palette. It was the perfect setting for the private after party! We used elegant black sequined linens on the high top tables, black and white chevron sequined runners on our white farm table estate tables, paired with square plates, perfect gold flatware and used Riedel red wine glasses with delicate Kate Spade polka dotted white wine glasses to finish off our tablescape. Gorgeous Gayla of Tiger Lily Weddings putting the finishing touches on their stunning floral design! Try moving the table runners from the center of the table to either side tucked under your plates for a fun, fresh take on tradition! Black and white keeps it elegant while the chevron and the pop of pink in the napkins keep it light and unexpected! Gold flatware on square plates were the perfect finishing touches for this tablescape. How perfect are these invitations?! Brydon Holsey & I collaborated on the design and it came out incredible! All I had to do was give Brydon my inspiration and color palette and she just absolutely nailed it! This cake by Monica at Sablee might be my most favorite part of the entire design! I mean, how can you go wrong with polka dots, stripes, gold confetti and our very own Scarlet ampersand?! The cakes Monica makes are absolutely outstanding and we just love taking our clients to do tastings at her West Ashley bakery. The catering provided by Charleston Harbor Resort & Marina was outstanding...as always! Local favorite Firefly Vodka sponsored the tasty cocktails our guests enjoyed! Ampd Entertainment played remixed tunes and kept the party bumping! They're easily one of our favorite DJ's in the South and one of the first vendors we recommend to clients that want to get the party started and keep it going! Gorgeous cakes and outstanding tastings by Gardenia's Custom Cakes and Catering. Bit of trivia for ya, the owner of Gardenia's, Desmond Pringle, and I go waaaaay back to my pastry days in Atlanta when we were on the same pastry team. Working with him was probably my favorite part of being a pastry chef! Desmond even made my wedding cake when Tony & I got married back in 2011. Love me some Desmond!